Last night was a perfect evening. Met up with friends for yoga after work. The substitute teacher was incredibly relaxed. If not for her constant soft talks, I would have fell asleep half way. Then everyone piled into the Malaysia Restaurant nearby that we always go after yoga. Feasted on fresh clam, crispy roti, satayed meat, morning glory, and curry chicken. Driving home in the perfumed night air, we were once again mystified by the glory of beautiful March in California. It felt like summer. Needless to say, I went straight to the article on ¡°The Scent of the Nile¡±. The story of Jean-Claude Ellena, Hermes newest chief perfumer, creates a new perfume based on his inspiration from a trip up the Niles. Almost all of us had tried to smell a perfume on those testing papers in the store. Here is what the perfumers had to say about that! The great Guerlain perfumes¡ªAim¨¦ Guerlain created the first, Jicky, in 1889¡ªwere all tested exclusively on human skin, never on paper. They were expressly built to blossom and fade, over time, on the body. Today¡¯s customers, however, don¡¯t want five fragrances on their body at the same time; they prefer to sample perfumes on paper strips. As a result, most perfumes today are constructed to smell good, for a few seconds, on a paper strip¡ªwhich is a perversion, unless you happen to be made of paper. Indeed, many of today¡¯s perfumes don¡¯t last (Kenneth Cole¡¯s Black vanishes as quickly as a picked green mango), and they often clash with the body¡¯s natural smells. And how about that “lingering” smell of a scent? We seemed to only associate that phenomenon with beauty from the past, as if they only existed in black and white movies. Ellena¡¯s best-known fragrances are Eau Parfum¨¦e au Th¨¦ Vert, for Bulgari, and First, for Van Cleef & Arpels. Just before joining Herm¨¨s, he had created L¡¯Eau d¡¯Hiver for Fr¨¦d¨¦ric Malle¡¯s ¨¦lite collection, Éditions de Parfums. … On the other hand, he said admiringly, the Guerlain scent had a marvellous sillage¡ªthe olfactory wake that trails behind a wearer of perfume. Someone once defined sillage to me, rather metaphysically, as the sense of a person being present in the room after she has left. Creating a sillage that is potent but not overpowering is tricky. With L¡¯Eau d¡¯Hiver, Ellena said, he wanted to pay homage to the Guerlain scent¡¯s sillage¡ª¡°but in enlightened form.¡± He selected elements from Apr¨¨s l¡¯Ond¨¦e that were ¡°soft, comfortable, light.¡± One of these was the natural essence of hay. He took some aub¨¦pine, an olfactory blend of finger paint and the wax used to clean linoleum floors, and added it to methyl ionone, a synthetic whose smell suggests iris. He then added a few more ingredients, including a natural distillation of honey. It took him two years to perfect his formula, which in the end contained twenty ingredients¡ªvery few, for a perfume. L¡¯Eau d¡¯Hiver smells, delightfully, of ground white pepper and cold seawater, with a touch of fresh crab. And it has a sillage worthy of Guerlain. Ever since Fang Zhou guided me into the world of scent, i have been fascinated by the beauty of this particular chemistry. Ellena is proud to be an illusionist. ¡°Picasso said, ¡®Art is a lie that tells the truth,¡¯¡± he told me. ¡°That¡¯s perfume for me. I lie. I create an illusion that is actually stronger than reality. Sketch a tree: it¡¯s completely false, yet everyone understands it.¡± The point of Un Jardin sur le Nil, he said, was not to reproduce the scent of a green mango but, rather, to create a fantasy version of green mango. THE SCENT OF THE NILE, Jean-Claude Ellena creates a new perfume. By CHANDLER BURR. The New Yorker, Issue of 2005-03-14. 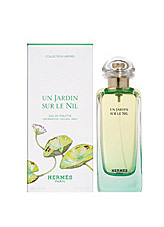 And here is a user’s review of the perfum: Un Jardin sur le Nil. I’m glad you like it. My sister introduced me to that flavor of “bath bumb” (that’s what her bf called them), it was “seaweed”. I was told to throw the ball in the bath tub, and it was fun to watch it swirling around like a bumb! 🙂 Tidal pool! That’s an accurate description! ha. Did Gui ever tell you about the time we went to Royal Botannical Gardens near Hamilton, Ontario? Part of the gardens features many, many types of lilacs. We went when they were blooming and did some sniffing. I developed a pretty bad headache due to scent overload. No, I’ve never heard this little episode of yours with scent. 🙂 I can totally imagine the headache from scent overload. There are certain flower’s scent could really get me sick. Luckily, most of them live outdoors, and the breeze and open space usually diluted it to lessen the affect on me. whew!